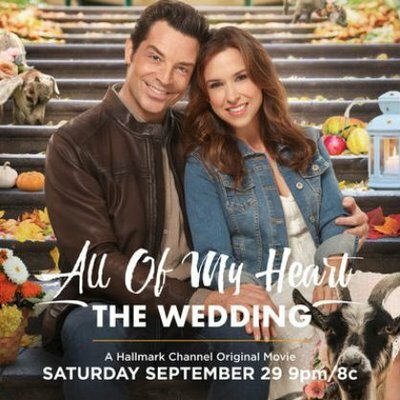 On September 29, the original Hallmark Channel movie All of My Heart: The Wedding will debut at 9 PM. Jenny (Lacey Chabert from Mean Girls and Party of Five) and Brian’s (Brennan Elliott from Cedar Cove) wedding plans are interrupted when Meg arrives, claiming she’s also an heir to their inn. Now they must focus on raising the money to buy Meg out, and Brian considers returning to Wall Street, until Bucks County has a fundraiser. Still, they’re short on the funds they need, and an interested buyer shows up who intends to rebuild the aging structure rather than tenderly repair it like Jenny and Brian always have. For now, though, focusing on marrying is all that matters to these loving innkeepers, who hope their happy-ever-after can be spent creating more romance in Emily’s Inn. Here is a trailer for All of My Heart: The Wedding.